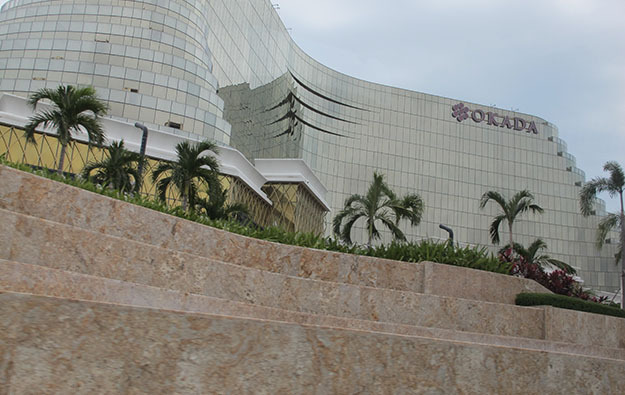 Minority shareholders in Asiabest Group International Inc have ignored an offer to buy them out made by Tiger Resort Asia Ltd of Hong Kong – the company that owns the operator of the Okada Manila casino resort (pictured). Asiabest told the Philippine Stock Exchange (PSE) that the tender offer agent had not received a single application from shareholders wanting to sell their stock when the mandatory offer ended last Wednesday. Tiger Resort Asia offered to acquire the 100 million common shares in Asiabest held by the minority investors at PHP3.2325 (about US$0.06) each, so that equity in an unlisted subsidiary that runs the Okada Manila, Tiger Resorts Leisure and Entertainment Inc, could be listed at the PSE though the back door. Tiger Resort is owned by Japanese conglomerate Universal Entertainment Corp.
Asiabest shares were changing hands at PHP26.40 each when the exchange closed on Friday. The Manila Standard newspaper said the stock price was buoyed by expectations that Tiger Resorts Leisure and Entertainment will be folded into Asiabest. Early during Monday’s session the shares were trading at about PHP28. The mandatory tender offer ended on December 12. The offer was triggered by a share purchase agreement from Tiger Resort to acquire 200 million shares in Asiabest, equivalent to a stake of about 67 percent in the company, for PHP646 million. One minority shareholder in Asiabest, Carnelll Valdez, had asked the Philippine Securities and Exchange Commission (SEC) to halt the tender offer because Tiger Resort Asia had failed to disclose its dispute with Japanese gaming magnate Kazuo Okada. Mr Okada founded Universal Entertainment but after a series of legal actions no longer controls it. Mr Okada is disputing the arrangement for the backdoor listing of the Okada Manila operator, taking his case to court. Asiabest said in a separate filing that Mr Valdez’s claim had been dismissed by the Markets and Securities Regulation Department of the Philippine SEC. The body ruled that no violation had been committed by Tiger Resort Asia and that at the time of filing the tender offer, Tiger Resort Asia “was not yet required to disclose the pending criminal and civil proceedings in Hong Kong”. The Philippine SEC ruled however that Tiger Resort should file an amended tender offer report, as the company is required to “provide the factual information regarding the proceedings in Hong Kong in the interest of the public and for the protection of investors”. The company will also have to extend the tender offer period for 10 business days from the publication of such amendment. Last year Mr Okada was shunted from the board of Universal Entertainment and then removed from the chair of Tiger Resorts, Leisure and Entertainment. He was subsequently removed from Okada Holdings Ltd, a private company in Hong Kong, and is taking legal action there to regain control of the company, which holds more than two-thirds of the stock of Universal Entertainment.